When choosing a studio mixer we’re usually looking for a combination of features and sonic fidelity, and where in a live situation we might be willing to forgo some of that fidelity in favour of reliability or simply more inputs, in the studio there’s always going to be a nagging feeling if we fail to get the best sound possible. With that in mind, it’s not uncommon to head for vintage analogue gear, however prices can be steep and quality variable. Here we’ve put together a buyer’s guide that has a bit of everything, incorporating cheap, expensive, analogue and digital. Some of these desks offer traditional simplicity, while others modern flexibility, and in many cases incorporate USB DAW integration and other forms of multichannel interfacing. So, whatever your needs and budget there should be something here that ticks the right boxes and will hopefully assist with the tricky business of choosing the right studio mixer. Gear4Music’s Sub Zero brand turns out some excellent value products and the Mix06USB is no exception. The 6 inputs comprise 2 mic/line inputs with phantom power and 2 stereo inputs arranged over 2 mono and 2 stereo channel strips. Each includes 2 band EQ, balance/pan, level and dedicated prefader auxiliary, which feeds a ¼” output on the back. Round the back you’ll also find the main outputs on two ¼” jacks, and a stereo headphone output. On the top there’s a 2-track input/output and a further mini jack input for connecting an mp3 player. Down the right you get 4 master level controls (auxiliary, headphone, 2 track and main), and the unit also includes a USB port for stereo recording to DAW. Overall, the Mix06USB delivers quite a bit for its incredibly modest price. The ‘pro’ version of Roland’s smartphone-friendly mixer can handle up to 3 mono and 3 stereo inputs and includes one XLR combi input with switchable phantom power, one HiZ ¼” instrument jack and one mini jack mic input for lapel mics. Further inputs are two stereo line inputs on a pair of minijacks, and two mono line inputs on ¼” jacks. There are five level knobs (four input and one output) and the physical output is on a single mini jack. The four input knobs blend the 9 input sources to one stereo mix. Go Mixer Pro is also a 2 in 2 out USB interface (iOS, Android, Windows and OS X compatible) and can be bus or battery powered. You can even prop up your tablet or phone in the groove. Overall it provides a great miniature option for the mobile producer. The latest update to A&H’s long running analogue ZED series bundles 4x4 USB interface alongside GSPre boutique preamps and onboard effects for a powerful studio ready solution. You get four mono mic/line channels (with phantom power) plus three stereo inputs. The first two channels include a high impedance DI mode, while the four mono channels feature separate balanced/unbalanced TRS and XLR inputs, with the stereo inputs on TRS jacks. The GSPre preamps are super quiet and have bags of headroom, and all mic inputs include a 100Hz low cut filter alongside 3 band fixed frequency EQ. USB operation is also sensible, with 3 routing configurations. Finally, an onboard FX send and processor rounds things off. The ZEDi 10FX is well designed, well built, well equipped and is great value for money. Art’s 5 channel mini mixer includes 2 mic, 2 line and 1 Hi-Z instrument input with optional amp simulator effect. The mixer’s tube credentials are via an assignable 12AX7 tube stage, which can serve either the pair of mic inputs, or the single instrument input. There are 4 mixer strips (3 mono and 1 stereo) and all include 3 band EQ, 2 auxiliary sends and pan. USB connectivity is 2 in / 2 out with a dedicated USB Return level. Meanwhile either the USB output or main mix can be switched to the rather nice VU meters. Finishing off this very retro styled mixer are wooden end panels. All told it’s a stylish desk and an ideal all in solution for small studio set ups. This mid-range configuration from Mackie’s well established analogue range, includes 10 Onyx mic pres, 2 stereo group buses, 4 auxes with dedicated stereo returns and a host of rear panel connectivity, all at an amazing price. You get 16 inputs in total arranged as 8 mono and 4 stereo channel strips. The mono channels get 3-band EQ with swept mid, while the stereo channels have 4-band fixed frequency EQ. All channel strips can route to the 2 stereo group buses (the pan pot allows you to blend between them) as well as main the stereo mix bus, and the first 8 channels also include a post fader direct out, which is available on the back panel. Further options include selectable pre and after fade solo, two headphone outputs and a stereo in/out tape loop on phono connectors. The 1642 VLZ4 is a traditional analogue desk with no DAW interfacing, but delivers a clean signal path, solid Mackie build quality and is ideal for recording small groups. Quality analogue design, Soundcraft heritage EQ and familiar layout form the basis of this surprisingly affordable recording desk. Add in multitrack USB interfacing on the MTK version (24 in 22 out) and things step up quite considerably. You get 22 inputs arranged as 14 mono and 4 stereo channel strips. These incorporate 16 Ghost preamps, Soundcraft’s 4-band Sapphyre EQ and dbx limiters on the first 8 channel strips. Four of the inputs can also handle Hi-Z instruments. There are 5 auxiliaries and dual engine Lexicon effects hardwired to Auxes 4 and 5. Meanwhile channel routing incorporates 2 stereo buses plus the stereo mix output. All channel strip outputs are sent to the USB interface and USB DAW outputs can be selected on each channel strip using the USB return button. Long throw 100mm faders help if feel like a professional desk, and overall the Signature 22 MTK is ideal for tracking multiple mic set ups such as bands. 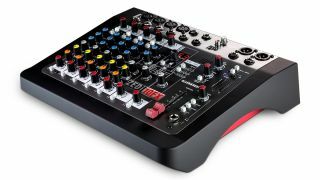 The X32 Producer is the cheapest of Behringer’s three X32 digital mixers, but it still packs a serious spec. With 16 Midas designed mic pres, 17 100mm motorised faders, 32 channel USB DAW I/O and onboard effects, you’re getting lots for your money and in a pretty compact footprint. What’s more, despite its potential complexity, the X32 Producer’s simple layout incorporating global physical controls for channel strip gain, dynamics and EQ make it easy to use. Channel LED metering complements the screen driven parameter visuals, and rounding things off are 8 effects slots, 8 DCA groups, input expandability via the two AES50 connectors and flexible routing via the physical outputs and monitoring. All told the X32 Producer is a supremely powerful tool at an excellent price. Yamaha’s long established 01V96i digital mixer offers familiarity and flexibility alongside versatile onboard processing and 16 channels of USB I/O. You get 16 analogue inputs arranged as 12 mic/line and 4 line level, with the 12 mic/line inputs also including inserts. The mixer surface features 16 100mm motorised faders and Yamaha’s established 3 layer workflow, so the faders control inputs 1-16, 17-32 and auxiliaries/subgroups. The desk has a potential 40 inputs and there’s flexible software input patching which incorporates the 16 DAW USB returns. Output routing is handled in a similar way. The Remote Layer allows you to control external DAWs using the console as a remote surface, and you can also use your computer to control many of the 01V96i's features once you've installed the included Studio Manager software. Clean, great-sounding audio capability, flexible routing and high-quality internal effects mean the 01V96i remains a great performer. StudioLive 24 Series III is the ‘middle’ model from the Presonus digital desk range. It has a host of impressive features including motorised long throw faders, flexible bussing, DCA grouping, vintage channel processing, onboard SD recording (32 tracks), 38 in/out channels of USB DAW interfacing and 55 in/out channels using AVB Ethernet. You get 24 main analogue inputs, incorporating 24 Presonus’ XMAX Class A mic pres. 12 of the inputs are mic only and 12 are combi XLRs for mic/line use. One further dedicated mic input is for talkback. There are 16 flexible internal buses and 16 physical bus outputs on 8 XLR and 8 TRS jacks. Global physical controls also include the Fat Channel at the top, and the 7” touchscreen, which accesses many further features including vintage hardware emulations. Overall, StudioLive 24 is an awesome multifaceted mixer and production hub. Professional mixing desks can be seriously expensive, but the ASP4816 offers professional level analogue mixing plus big console workflow in a compact and more affordable format. Each of the 16 inline channel strips includes a Class-A Audient mic pre and dedicated monitor/DAW return. This is via a traditional large and small fader configuration which can be flipped if required. You also get 6 auxiliary sends, 2 cue sends, 4-band EQ, 16 group busses (including routing to multiple busses and left/right panning) and input and return metering. The centre section includes facility for 4 loudspeaker outputs, 2 cue sends, 1 studio foldback send, 4 stereo inputs, oscillator, talkback alongside various output trim pots. There are also subgroup faders for the first 8 routing groups, and a traditional VCA mix bus compressor. All told the ASP4816 is an extremely elegant analogue desk that is ideal for recording.